Bring a pot of water to boil. Add the tomatoes and let soak in the boiling water for 5 minutes before removing. Cool and peel. Add the peeled tomatoes to another pot, incorporate the chicken broth, and bring to a boil over medium heat, cooking for 20 minutes. Add the remaining ingredients, stirring constantly over medium heat until a cream has formed. Add more milk or butter if necessary. Serve hot and garnish the center of each bowl with some cream and a few sprigs of parsley. To make the most of the chilly winter months, I like to prepare dishes that, generally speaking, I don't enjoy as much during the summer, such as broths and soups. 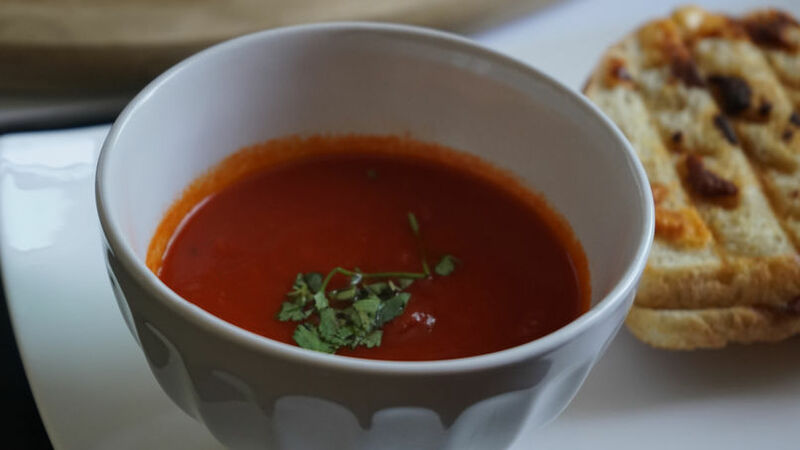 One of my favorites is the tomato soup recipe I am sharing below, which my mom taught me to make when I was little. You can serve it as the main dish or pair with other foods for a complete meal. I recommend using fresh tomatoes; pick the biggest, ripest ones you can find, since they'll add such delicious flavor to the purée. You might also try adding onion or garlic to the creamy blend. The idea with this dish is to experiment with your favorite flavors, "adding and tasting as you go," as my mom would say.